The Aquavore Diet was created by Dr. William Dunn, a clinician specializing in cancer treatments. His aim is to educate the public that being overweight can increase your risk of cancer but when you reach an ideal weight you can reverse this risk. He designed this diet to help people prevent the development of the problems he continually observed in his patients. It is primarily focused on eating foods with a high water content because this is one of the simplest ways of managing your appetite. The Aquavore Diet emphasizes foods that help you feel full while moderating your intake of carbs, sugar and fat. Many of these foods are those with a high water content such as fruit, vegetables and soups. It also includes foods that rank low on the glycemic index and high in the satiety index, which is a system used to measure how full you feel after eating a meal. Dunn provides dieters with recommendations for foods that will give you the most satisfaction and nutrition at the lowest cost. In particular soups containing beans and vegetables are emphasized because they are high in fiber, which will help fight colon cancer. One of the major principles of the diet involves starting every meal with these types of foods. For example, for breakfast you can first eat fruit and oatmeal with skim milk. If you are still hungry follow with an egg, a whole grain bagel or some yogurt. Lunch or dinner can commence with one or two cups of vegetable bean soup, which will dramatically reduce your appetite without providing many calories. If you still feel hungry eat more soup or switch to a salad with light dressing. After this if you want to eat pizza, it’s fine, but it is likely that you will be satisfied with just one slice, rather than wanting to eat the whole pizza. You can eat anything you like on the Aquavore Diet so long as you follow these guidelines. You can eat red meat occasionally but overall you should keep saturated fats to a minimum. Guidelines are provided regarding the best cooking techniques to reduce cancer risks such as stewing or boiling meats rather than grilling. Lentils, tofu, peas, salmon, lean beef, chicken, turkey, tuna, egg whites, skim milk, low fat yogurt, almonds, peanuts, walnuts, cherries, peaches, strawberries, sweet potatoes, squash, green beans, eggplant, oat bran, whole grain bread, gelatin, spices. At least twenty minutes of brisk walking is recommended on most days as part of the Aquavore Diet. If you are unable to walk due to joint pain you can try cycling or swimming instead. The Aquavore Diet retails at $19.95. Encourages the consumption water foods such as fruit, vegetables, and other low glycemic carbohydrates. Recommends a relatively high protein and fiber intake, which can reduce appetite. Flexible and does not require elimination of any specific foods. Can be followed as a healthy lifestyle approach to weight management. Only includes a few recipes. Many dieters will require more guidance and structure to eat a healthy diet. 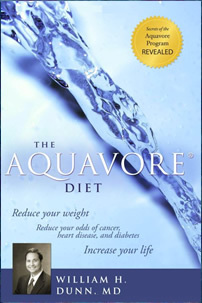 The Aquavore Diet is designed to help you lose weight and overcome obesity, which is one of the major causes of cancer. It emphasizes using water foods that are rich in fiber and protein and low on the glycemic index to naturally reduce your appetite, thus avoiding the need to count calories.